My husband lost his job. A few days later, I was diagnosed with breast cancer. I needed a double mastectomy. Our insurance deductable was $6,000 before it paid a single penny. My surgeon said I’d be off work a minimum of six weeks. All but a couple days of that would be without pay. Devastating news, but my faith in God granted me peace and gave me courage. I began searching for the things I needed for my mastectomy. One thing suggested was a button down mastectomy shirt. I began searching for such a shirt and found them to range in price from $60-120 before shipping! I was on the phone with my mom telling her how frustrated I was about this. Why were they so much? Was I being preyed upon because I had cancer? My mom told me to give her some time, but she would figure out a way to make me a mastectomy shirt. I didn’t know it then, but that was the moment the Courage to Conquer Cancer Recovery Tee was born. I’m so very thankful for my mom’s ability to sew and for keeping me in mind as she did. God blessed me well with my moma. I could never thank her enough for this gift of necessity. Wearing the shirt my mom made me to chemo. Over the course of ten days as well as many days after my drains were out, I made the statement to several people that all women should be able to heal with these shirts. My eldest step-daughter and husband made a few changes and made shirts for my Aunt Ola. She had a double mastectomy a few weeks after mine. Mom made another set for a friend of hers. My mind was spinning. 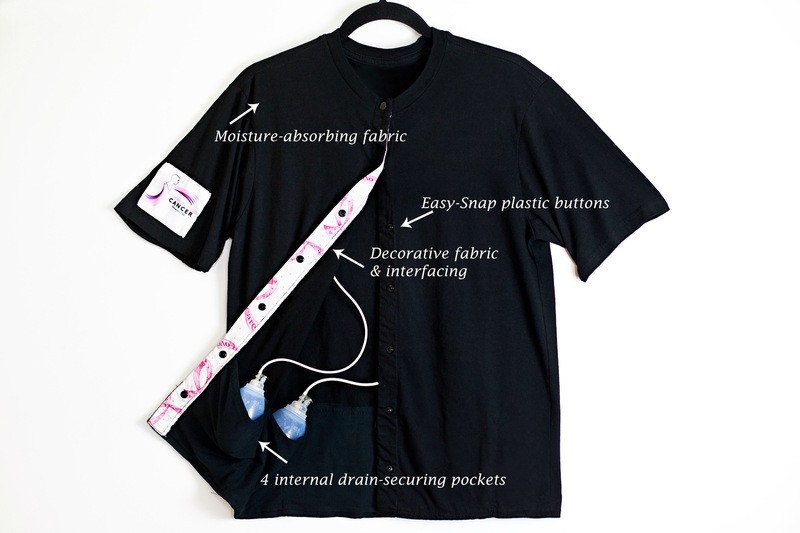 How could I get these shirts into the hands of mastectomy patients? How could I help lesson the burden? How could I use my experience to give back with the greater good at the core of my mission? I began praying. I started out by informing God I couldn’t sew just in case He had forgotten. 🙂 I was willing to do whatever He requested of me but if He needed me to learn to sew, please direct my path. God knows the gifts He has blessed us with therefore I didn’t have to learn to sew. Whew! I had several conversations with my brother, Cliff, and his wife, Kristi. We talked about many things, but we seemed to always come back to these shirts. Cliff and Kristi believed in my cause and began their own conversations about how they could help me. A partnership was born. 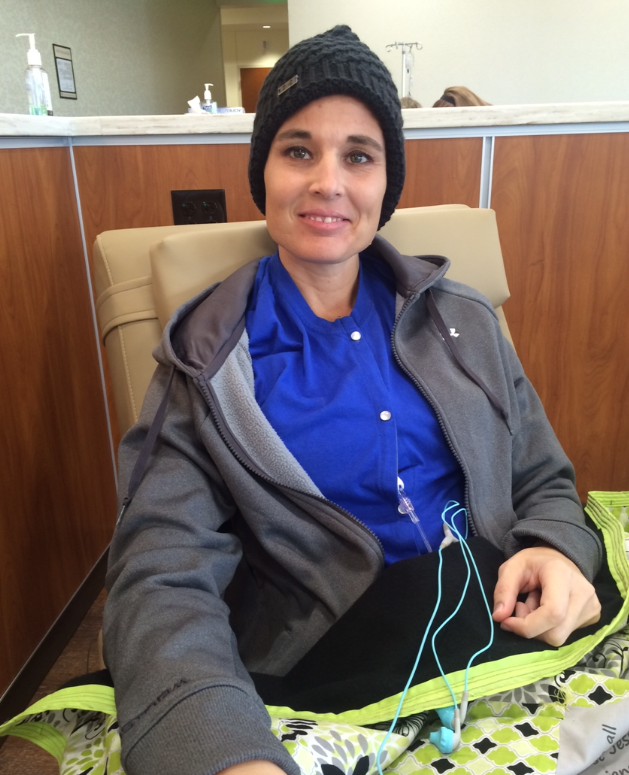 I was in the middle of AC chemo in Texas while Kristi was meeting with a seamstress in Tennessee. The questions filled a page. Several different types of shirts were made. I got in touch with my breast surgeon, Dr. Brian, and her cancer navigator, Michelle. I asked if they would be willing to donate these test shirts to women undergoing mastectomies. In return, we asked they complete a survey. The feedback was exactly what we needed. Kristi met with Voulnteer Blind Industries in Tennessee, and they agreed to partner with us in the production of our Recovery Tees. The majority of their seamstresses are blind, but their work is impeccable. They helped us improve our design even more. Our inventor/patent paperwork was completed. Our business was born, but what about the core of our mission? I felt driven to do more. What about women who breast cancer was discovered at that one unfortunate moment in time? What if they didn’t have a mom to create and sew a shirt for them with only several days notice? What if their support system was small or inadequate? What if they were extremely private and only told their inner circle? Your inner circle is as in shock as you are and often can’t think past this moment in time. What if coming up with even $20 seemed impossible? How could we reach out and help these women? I felt so strongly about our shirt project that I felt each patient undergoing a mastectomy, or any other surgery requiring surgical drains, should have one of these shirts. The Courage Conquering Cancer Organization was no longer an option but a necessity to help reach our goals. Our logo was design by my son-in-law, Pablo. A lot of time, paperwork, “angel investments” (as my brother calls them), and faith would follow. Nothing worth having comes without trials and tribulations. God continued to open doors. We’ve made our share of mistakes. We will make many more, I’m sure. God used breast cancer to teach me a very important lesson: Blessings surround us even as we walk through the valleys of the shadow of death or through the ashes of life. Beauty lies in the middle as well as on the other side. We have faith our Recovery Tees will bless many because we have faith in God and believe in the greater good. 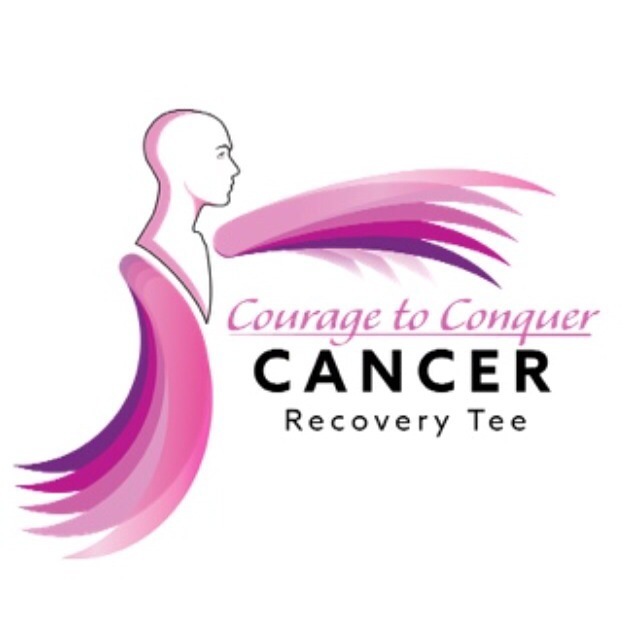 Courage to Conquer Cancer’s Recovery Tees can be purchased here. You can also donate to our non-profit organization. If you are a patient in need, there is also a way for you to contact us through your cancer navigator, physician, or social worker. Until there’s a cure, let us help you recover. This entry was posted in breast cancer, chemo, family and cancer, fundraiser, give back, mastectomy, port surgery and tagged Mastectomy shirt, post surgical shirt, Recovery Tee, shirt for surgical drains. Bookmark the permalink.